Several years back there was a surge of ‘surf and earn‘ websites all promising to take your money and multiply it right before your eyes. It was a trap that millions of people fell for. Of course, in order to get the masses coming in, lots of people had to earn big first. And many did. Earn BIG… like 6 and even 7 figures. Maybe you remember one of the biggest surf and earn sites ever. It was called AdSurf Daily or ASD for short. There were a lot more but ASD was famous because they grew faster and larger than all the rest and because the US government shut them down, leaving 100’s of thousands of people shaking their heads in confused disbelief. ASD was the beginning of the end for surf and earn sites back then. Deemed ponzi schemes and illegal investment sites, they all began to fade away. Back then everyone seemed to be doing everything wrong. Using investment terminology all over their website and in promotional material. That’s a huge no-no for anyone who is not a legal, licensed investment entity. Promising specific guaranteed earning percentages daily or weekly. Having no real products or services to sell to retail customers. One of the many reasons ASD was shut down was because they had ZERO retail customers. Everyone was required to ‘surf’ in order to ‘earn’. So, for at least 3 or 4 years after all those sites dissolved into oblivion, we all felt much safer. Then one day in December, almost 2 years ago, My Advertising Pays opened their doors. Another Surf-n-Earn program. Oh No! Well calm down because MAP was not the same. Didn’t really matter to a lot of people though because it looked too much like something that burned them once before. Unless you weren’t around for the previous scam-craze OR you knew exactly what to look for. MAP was in fact a different breed. Created by a US Air Force Disabled Veteran, that certainly helped to buff negative reactions. Centering all value on the advertising products was another positive. Of course not having any investment terminology and not promising or guarantying monetary gains also made them different. Unfortunately though, MAP did end up pulling out of the US market and I suspect it was because certain eyes were upon them and they knew they could not prove they had a legitimate retail customer base yet. The main take-away you need to get out of this is that My Advertising Pays paved the way for a new breed of surf and earn opportunities. However, it also opened the doors to less savvy, money-hungry, and dishonest scam artists who will always take advantage of a trend if they think they can get some of your hard earned money before you realize what’s really going on behind the curtain. Once again, there is a surge of new surf and earn websites popping up all over the Internet. You should know that very few are legitimate. Most of them are what I call “Throw-Away Sites” and there are signs that you can look for that could end up saving you thousands of dollars and countless wasted hours.​ I call them throw-away sites because the owner plans from day 1 to get as much money in as quickly as he or she can and then shut the site down leaving no trace back to him/her. This is not a long list. In fact, I’m going to teach you 2 things you can look for that will separate the good from the bad and ugly. Designed to lure in the fat-wallet masses with promises of shared glory, throw-away sites tend to prominently display statistics on their home page. Statistics that look like they prove something but in reality they shout out S-C-A-M. Why do they think it’s a good thing to show when they launched, how many members there are, and how much money has been paid out (usually 7+ figures displayed)? And what makes them think we all believe those numbers couldn’t be fudged? The first one is obvious who it is. It’s My Paying Ads. The second one is AdBrook. When I saw these stats on both sites’ home pages I was already 95% sure these are throw-away sites. Then I went to Step 2. Any legitimate company will want you to know exactly who they are. I mean, why start a company and put your unique ideas into motion and then never tell anyone who it was who had this revelation? Who does that? I’ll tell you who… People whose only motive is to make as much money as they can as quick as they can and then shut the whole thing down before anyone realizes what just happened. I told you before, these scammers plan ahead. Way ahead! To have a website you have to register a domain, right? You must have a domain before you can even begin to build a website. Go to Mr. Google and ask him about ‘WHOIS Search’. I like to use DomainTools.com because they were one of the first and their website loads very fast. What you’re going to do is a Whois search for a specific domain, like MyPayingAds.com or AdBrook.com. As long as it is a real domain that’s registered, you will see all the registration data for that domain. Or maybe not… Not if the person who bought that domain never wanted you to know who they really are. 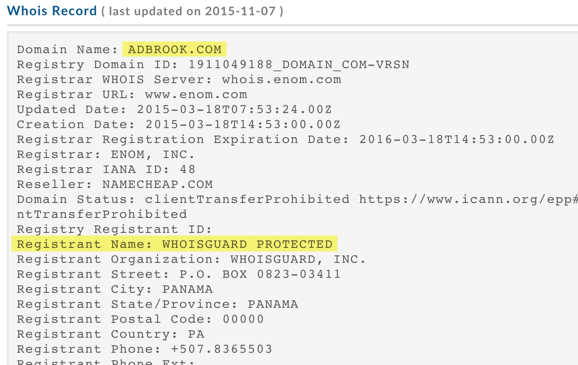 See that WHOISGUARD thing next to Registrant Name? 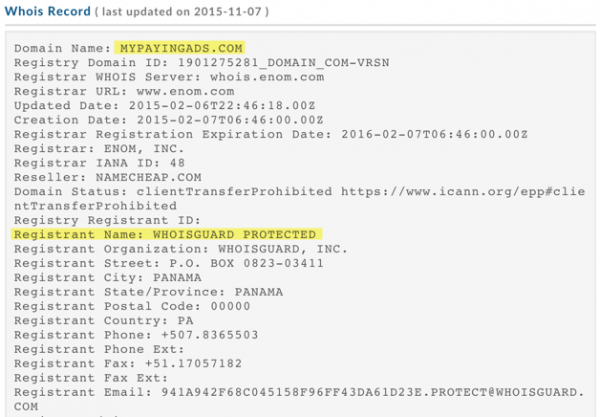 The person who bought the domain, MyPayingAds.com, actually paid more to have his or her true identity hidden. Yep, same thing. Well that’s not a good sign is it? Now, in order for me to do a good job of teaching you what to look for, I have to say there are some who pay for a similar service called Whois Privacy Protection. As the name implies, it’s for privacy protection and there are some good reasons why some people might pay for that service. For example, if they work out of their home they probably won’t like the idea of any Joe Blow out there getting access to their home address. That could definitely be a safety issue for them and their family. You know as well as I do, there are at least 3 crazy people out there. So, if step 1 applies and step 2 shows Whois privacy protection, then take your due diligence one step further. Go to the website and see if the owner hides who they are or not. It’s one thing to hide personal and private information but telling people your name, your vision, and perhaps a picture of yourself is safe and makes people feel a lot more comfortable. If you can’t find anything or, even worse, it’s blatantly obvious that the owner doesn’t want anyone to know who they really are, then proceed with caution. Or better yet, leave the site and never go back again. Your wallet will thank you. I have been using this same 2 step process for over 10 years now. I never joined AdSurf Daily because of this simple process and there’s no telling how much money that saved me. I also used this same process to do my due diligence on Traffic Monsoon. Step 1 was quick and easy. It always is but it’s even quicker when you don’t see those erroneous stats displayed. Step 2 slowed me down a bit with TM because the owner did use Whois Privacy Protection. Following through, however, taught me that the owner is not only very open and transparent about who he is but he also has good public reputation that anyone can find online and he has been known to even show up impromptu at local events and talk about his vision for the company. Charles Scoville is his name if you want to look him up yourself. Just yesterday I learned that Traffic Monsoon smashed 1.9 Million members/advertisers. That’s a crazy number right there. That made me think about the privacy issue again. Would you want 1.9 million people knowing exactly where you live? I hope you enjoyed this ‘awareness’ training and you’ll put it to good use. The lesson to be learned here is to know how to protect yourself from would-be scammers but also, and just as importantly, know that not everything is a scam. I believe Traffic Monsoon will bring about a new generation of top quality advertising websites that also offer that truly passive income opportunity that we all love. As long as we know what to look for, together we can debunk all the misfits and help the cream rise to the top. SHARE this to help spread the word. Great Article. Since Maps I’ve be withdrawing from MPA Everyday. Now I have to check on Triple Thread even Though I’ve talked to the owner. Thanks for the ‘heads-up’ Clay. Wish I had known some of this before although I do know about WHOIS, I certainly haven’t used it enough. Thanks Clay, very informative article. You bet. Hope you get some benefit from it, Yannick. That was a good read thanks Clay lots of quality info. Thanks Colin. So glad you enjoyed it. Great info ! Wher edo I sign up to follow you? Hi Cheryl, thanks for the feedback. You can use the brown banner at the top right of my blog in the sidebar to get on my list. I assume that’s what you mean by following me.